Crumble,P.(2011). 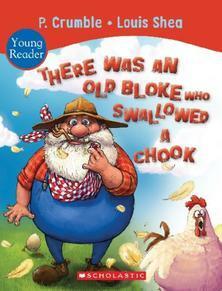 There was an old bloke who swallowed a chook. Scholastic Australia, Sydney.I would teach this book to children from Kindy to year 3 depending on their literacy levels.This is a little rhyming book that is a take off of the 'There was an old Woman', it again mixes the various animals that are eaten to get the original animal eaten. I like this little book because one it is using Australian animals and it still incorporates some of the old slang language used back in the 70/80s. I like the way that they have used various animals in Australia, making it a good book to use when teaching S+E in class. It is also excellent to use when teaching on Australian history, and animals.With having to do a couple of books on Poetry, this is also excellent to use in this area, the rhyming of words, and the rhythm of a song, would help students pick up on their phonics.If I were teaching from this book it would be one that I would work with as an Accelerated Literacy book, because of the use of the rhymes and phonic awareness that it has.I think that when reading books like these to children it will encourage them to think of ways that they could change words around on stories, poems, songs etc and that in keeping to the sequence of the rhymes that you could come up with some funny songs, poems, stories that could be lots of fun.It can help them learn ownership to their newly created pieces, and even make them into books themselves.